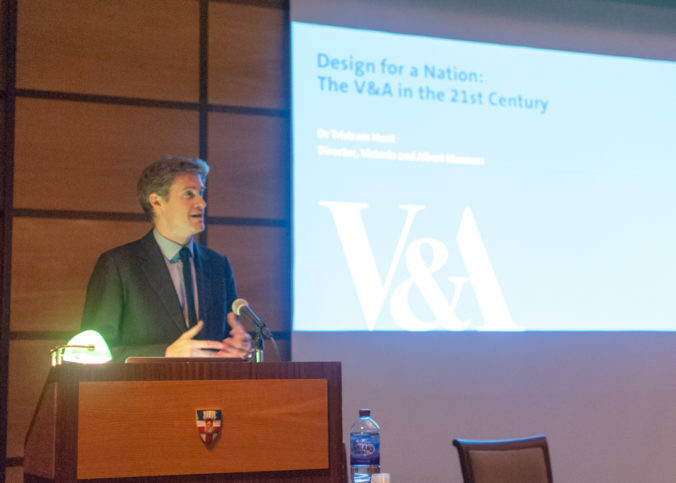 As part of the fiftieth anniversary of Birkbeck’s History of Art department, we welcomed Tristram Hunt, the director of the V&A, for a lecture at Senate House. He began by outlining the museum’s origins in the nineteenth-century design school movement, such as the Government School of Design once based at Somerset House, and the Museum of Manufacture. The spur to the creation of the South Kensington museum, the forerunner of the V&A, was the Great Exhibition of 1851, which aimed to celebrate ingenuity and imagination. That purpose continues today, with around 38% of the V&A’s visitors coming from the creative industries. The aims of the South Kensington Museum were in part to perpetuate the 1851 Exhibition. Its first show was a display of bad taste, with the purpose of educating the public to make better aesthetic choices. Dr. Hunt wondered whether such an exhibition would get the green light today. He went on to discuss the V&A’s role in education more generally. It has its roots in such radical educators as Gottfried Semper, an associate of Henry Cole and once a lecturer at the Government School of Design. It also has links with Birkbeck’s foundations as a place of education for technical workers. The V&A holds works by Richard Burchett, a student at the Birkbeck Mechanics’ Institute who went on to become a tutor at the Design School. The V&A’s collections were also themselves used as teaching aids. After the Queen loaned the Raphael cartoons to the museum, every student at the Royal College of Art would go there to draw from them. The collections are growing continually. Some of the most recent acquisitions are a 3D-printed gun, a Burqini, and a Jeremy Corbyn T-shirt. Some acquisitions attract considerable criticism, and Hunt defended the museum’s decision to collect part of the Robin Hood Gardens housing estate. The acquisition was widely criticised, both on the grounds that Brutalism was not worth collecting, and also that the V&A was effectively condoning the destruction of social housing. Hunt pointed out that the V&A has always collected domestic interiors, and the museum would be neglecting its duties as a museum of design were it not to have collected a signature example of Brutalist architecture. The V&A is expanding to new locations, and the lecture was given just over a month after the opening of V&A Dundee, already attracting large numbers of visitors. Dr. Hunt looked to the future, with V&A East in London’s Olympic Park planned in collaboration with the Smithsonian, and Here East, a project to relocate the museum’s storage facilities to East London with plans for provision to allow some degree of public access to those collections not normally on view. As Hunt ruefully acknowledged, Brexit presents a big challenge. The rural/urban divide that the Brexit vote highlighted is an encouragement to the V&A to lend more widely across the UK, and that lending is also a response to the collapse in funding for local authority museums. He also pointed to the drastic fall in take-up of arts and technology subjects at GCSE, and highlighted an initiative to lend to regional museums specifically to support GCSE teaching of art and design subjects. The Museum of Childhood in Bethnal Green is also due for a revamp, and the project is being planned in collaboration with local schoolchildren. In conclusion, Tristram Hunt summed up the role of the museum in challenging times: championing cosmopolitanism, maintaining a trusted factual basis of knowledge in the public sphere when ‘post-truth’ is a growing phenomenon, continuing its role of museum as educator, and not least celebrating wonder and beauty in art and design. Get occasional updates about our events. You can unsubscribe at any time. Museums and Islamic Art: Whose Culture? Whose Colony?